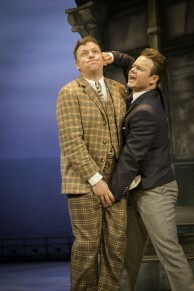 Sam Alexander is currently performing as Stanley Stubbers in One Man, Two Guvnors at the Theatre Royal Haymarket. Sam’s acting experience includes performing on campsites and in village halls in Brittany, being a part of The Royal Shakespeare Company and on stage at The Globe Theatre. Sam took time out earlier this week to answer some questions about his career and One Man, Two Guvnors. You graduated from Bristol University with a degree in French and Drama. What was the inspiration for studying these two subjects? I was unsure what to do with myself post school. Acting was very much my main interest but I didn’t have the balls to announce to the world ‘oh yeah, I’m going to be an actor’. I planned to do French and German at university because I loved languages and thought that would be a sensible option. Then, flicking through the prospectuses one day in the sixth-form library, I came across a BA joint honours in drama and modern language. I still remember thinking: ‘yup, that’s the one for me’. You toured with outdoor shows in Brittany for six years. Can you tell us about this? While studying in Paris for the 3rd year of my degree, I made friends with a fellow called Benoit who had his own fledgling theatre company. He asked me to join them that summer. The plan was to rehearse a play and then take it on a tour around Brittany. It was six weeks of really hard work, of performing in campsites and village halls, of arranging songs around a campfire and busking with them the following day for beer money. After six summers of this we were playing festivals not campsites and actually getting paid! The company still exists – it’s called ‘La Carotte’ – and I still join them for their own summer festival that attracts thousands. LAMDA was your choice for drama school. What is your favourite recollection from your time there? Pretty much all of it. It’s knackering and intense and agony at times (mainly when someone tells you you’re rubbish) but drama school is ace: suddenly you’re being an actor all day long. Your first stage role after LAMDA was as the Young Shepherd in The Winter’s Tale and then Troilus and Cressida at Shakespeare’s Globe. What is it like performing at The Globe? Can you describe your first experience? I did two seasons running at The Globe and atmosphere-wise nothing beats it I would say. The groundlings have paid a fiver to stand so they are massively up for it from the word go. If the production’s good – and most of them are – that’s infectious for the actors and the rest of the audience too. Shows can really take off. 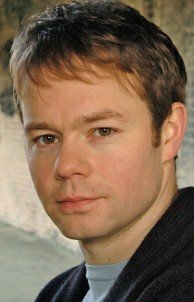 You subsequently performed in several more Globe productions as well as A Midsummer Night’s Dream at Regent’s Park Open Air Theatre. What do you enjoy most about performing in the open air? Some of the summer nights at Regent’s Park are really still and the setting seems perfectly suited to telling a story. There’s something timeless about doing away with walls and comfy seats and breathing in lungfuls of fresh(ish) air while you perform. On the windy nights you had to really bellow to make yourself heard (no mics in those days) but I took a perverse pleasure in acting at full volume. Shakespeare plays are a significant part of your career. Do you have a favourite role or play? Not really, I’ve liked most of the roles and whichever play I’m working on tends to become my new favourite. If pushed, I’d say Dromio of Syracuse in Comedy of Errors. Some people are a bit snooty about that play but it’s really tight comic writing. A team of US sitcom writers would be delighted if they came up with some of those scenes. Shakespeare did it 400 years ago. How does it feel to perform with the RSC? It’s a wonderful company to work for. The RSC and the National have the resources at their disposal to rehearse and put on plays without making compromises along the way. As far as I can tell, every other theatre in the land is waging a constant battle to skimp and save where they can. It’s very sad and can’t carry on indefinitely or there will be nothing left. You were in the cast of the RSC’s Hamlet film (2009), starring David Tennant and Patrick Stewart. What did you enjoy most about being in this production? That was the filmed version of the stage version we’d done. There was loads of hype about the production from the minute the casting was announced and we rose to the challenge as a company, I reckon. It was a real treat to be reunited with the cast a few months later and work out how to transfer our version to the screen – particularly as David had been injured and unable to perform for much of the West End run. It finished off a memorable job really nicely. You have many film and television credits to your name. Which is your favourite television role and why? Probably the fresh-faced copper I played in ‘Criminal Justice’. But I’ve just done a cracking little part in a an episode of a new BBC comedy series called ‘Quick Cuts’. It’s proper funny, I recommend you look out for it. Stage and Screen. What are the main positives for each of them to you? The dollop of adrenalin mustered for each unique performance in theatre. Every night could be the night you get it spectacularly wrong or spectacularly right. Screen is about exploring what a character is thinking not just what he’s saying. I love that. You are currently starring as Stanley Stubbers in One Man, Two Guvnors. What attracted you to this role? The lines that Richard Bean has written for him. How much pressure did you feel when joining an already successful show? I blanked that out as much as I could. To be on the safe side I didn’t see the previous cast do it. That probably would have made me worried about filling someone else’s shoes. What can you tell us about your character Stanley Stubbers? He is a real go-er. He boxed at public school. If body hair is an indication on manliness he is all man. He is very in love with Rachel. Why should everyone come along to see One Man, two Guvnors? Because laughing is good for you. Long walks, real ale and good food. Usually in that order. Any message to those that are following your career?